This kit may be used on CE (1989) and later manual start 45 cu. in. (737 cm3) commercial motors without A.C. lighting. It provides electric starting at the motor and 4 amp (at 5500 RPM) battery charging, while retaining the manual start feature. The installation of this part/kit requires special tools and involves procedures described in detail in the Service Manual for your product. 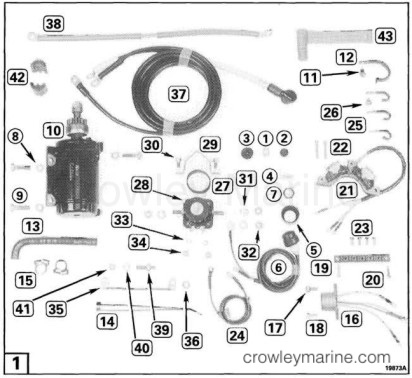 If you do not have the tools and literature required, have this part/kit installed by your Evinrude/Johnson Dealer. Read installation instructions completely before starting work. Remove spark plug leads from spark plugs. Loosen the shift lever to steering bracket screw (A) to allow room for installation of the start button and start switch. 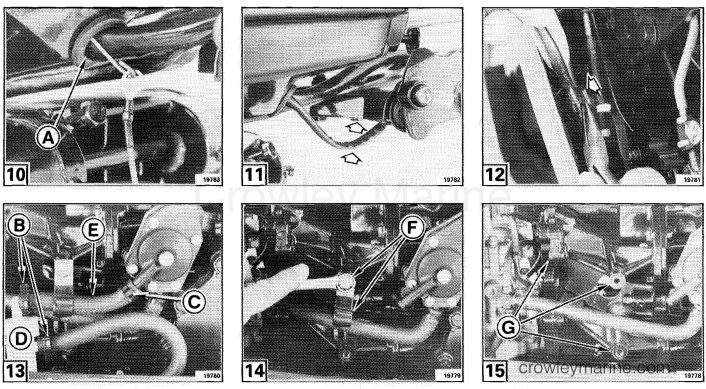 Place shift lever (B) in REVERSE. Place start button spring (1) over outer start button (2). Insert inner start button (3) through shift lever (C) over outer start button and press until they snap together. Move shift lever to NEUTRAL. Remove backing from start decal (4). Place start decal on shift lever. Place shift lever in FORWARD gear and install start switch mounting ring (5) over start switch leads until mounting ring seats on back of start switch (6). Insert start switch cable thru start switch hole (D) in steering bracket below back of shift lever. Seat start switch in hole in steering bracket. Place start switch nut (7) over start switch leads (E). Install start switch nut on start switch and tighten securely. Tighten shift lever to steering bracket screw (F) to a torque of 18-20 ft. lbs. (25-27 Nm). Slide insulating sleeve until it is firmly against back of start switch. Lubricate the grommet and switch leads with alcohol or liquid soap and pull the leads thru the grommet (A) in the lower motor cover with a hooked wire. Pull the wires until they lie close to the steering bracket. NOTE: Loose start switch wires will be damaged if they come in contact with the shift lever. Open J-clamp on starboard front powerhead support bracket. Place start switch leads into J-clamp and close clamp. 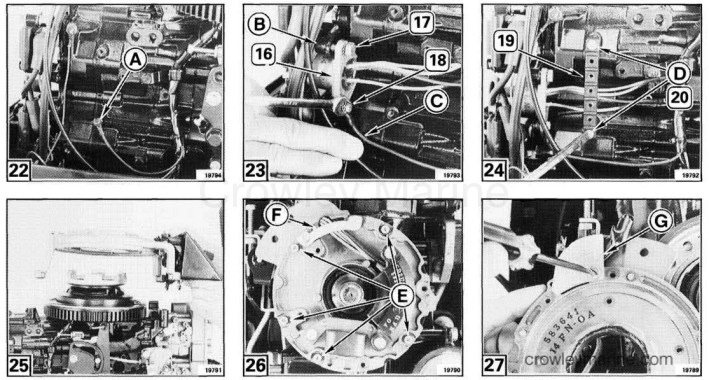 Remove and discard the filter hose clamps (B). Cut the tie-strap (C). Remove the filter (D) from the hoses, and remove the filter hose (E) from the fuel pump. Remove and discard the screw and clamp (F). 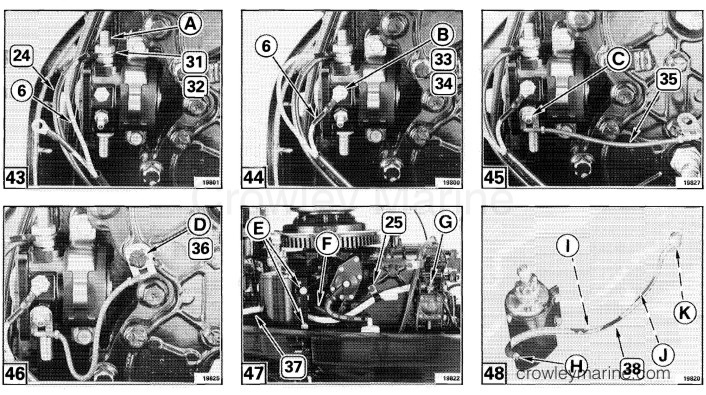 Place lock washers (8) onto screws (9) and position starter (10) on port side of motor against mounting bosses (G). Secure starter with three screws and tighten to a torque of 120-140 in. lbs. (14-16 Nm). Use the 1/4 x 1/2 in. slot-head screw (11) to secure the filter clamp (12) to the exhaust manifold cover. Position the clamp to extend forward. Cut the fuel hose (H) to 4 in. length overall. Cut the fuel hose (13) to 3 1/2 in. length (I) measured as shown. Install the fuel hose (13) on the fuel pump inlet (J) and secure in place with a tie strap (14). Reinstall the filter on the hoses as shown and secure with new ratchet clamps (15). Form filter clamp (12) around filter. Remove and discard ground wire screw (A) from cylinder boss. Install rectifier (16) to cylinder head cover (B) with 1/4 x 5/8 in. screw (17). Place ground wire (C) (removed above) on #10 x 5/8 screw (18) and secure bottom of rectifier. Mount terminal block (19) to cylinder block bosses (D). Use #10 x 3/4 screws (20) coated with Screw Lock. Remove manual starter and flywheel. See Manual Starter Removal and Flywheel Removal in Service Manual. 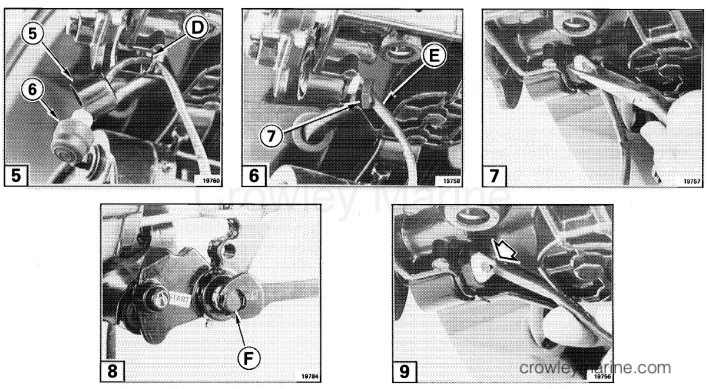 Loosen ignition plate retaining screws (E) and remove leads clamp (F). Lift off ignition plate and remove leads cover (G). Loosen both ignition module retaining screws. Remove and save screw (H) and discard spacer (I). Insert leads from stator (21) thru hole next to charge coil leads (J) as shown. Loosely install stator screws (22) and ignition module screw removed. Arrange all leads side-by-side in a single layer and install leads clamp. Pull vinyl sleeve up and install plate (K) over leads and over end of vinyl sleeves. Apply Nut Lock to five ignition plate retaining screws (L). Apply Moly Lube to the crankcase boss (M) (pilot for ignition plate). Lubricate the groove in the Delrin ignition plate bearing (N) with a light coating of Johnson® / Evinrude® Outboard Lubricant. Hold the ignition plate bearing compressed on the support plate with needle-nose pliers. Install the ignition plate down over the bearing. Hold retainer plate up in position and secure to armature plate with screws (O) coated with Nut Lock. Tighten screws to a torque of 25-35 in. lbs. (3-4 Nm). Place Coil Locating Ring P/N 334994 (A) over machined surfaces on ignition plate. 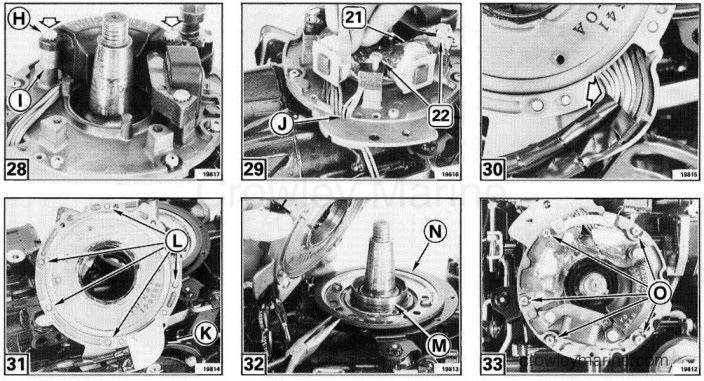 Push stator heels (21) and ignition module against coil locating ring. 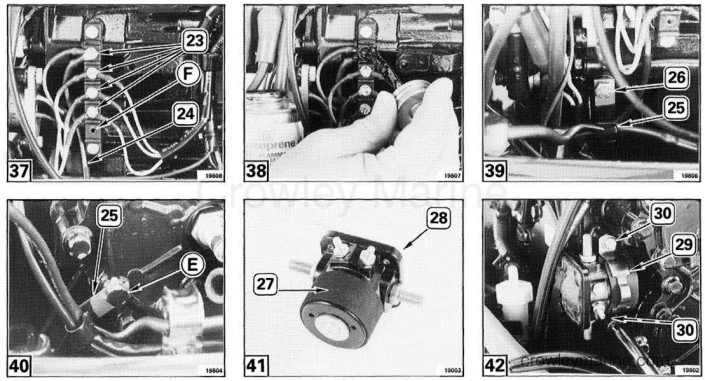 Remove both screws from ignition module (B) and both screws (22) from stator. Apply Ultra Lock to screw threads and reinstall screws. Tighten screws to a torque of 15-22 in. lbs. (1.6-2.4 Nm). Reinstall flywheel and starter. See Flywheel Installation and Manual Starter Installation in Service Manual. Secure leads in clamp (C) with sufficient slack at full throttle. Tighten clamp on wires and push clamp in against block to hold wires away from bracket (D). Connect rectifier, ignition plate and solenoid leads to terminal block. Use thread forming terminal screws (23) supplied. Put only leads with colors that match on each terminal. Route red lead (24) down to lower motor cover, behind cylinder head, and to port side. Coat screws (23) and wire terminals with Black Neoprene Dip. Install J-clamp (25) and 1/4 x 3/8 screw (26) in lower hole on starboard side of cylinder head. Tighten screw to a torque of 60-84 in. lbs. (7-9 Nm). Place red lead (24) and start switch leads (6) in J-clamp and close clamp. Remove second from bottom port side cylinder head cover screw (E). Install J-clamp (25) on screw and tighten to a torque of 60-84 in. lbs. (7-9 Nm). Place red lead (24) and start switch leads (6) in J-clamp and close clamp. Push rubber sleeve (27) onto starter solenoid (28). Place clamp (29) on starter solenoid. Mount starter solenoid to port rear of powerhead with 1/4 x 1/2 in. screws (30) provided. Tighten screws to a torque of 60-84 in. lbs. (7-9 Nm). Connect red start switch lead (6) and read lead (24) to solenoid top (battery) stud (A). Secure leads with internal star washer (31) and 5/16-18 nut (32) provided. Tighten nut to a torque of 120-140 in. lbs. (14-16 Nm). Place yellow/red stripe start switch lead (60 on solenoid top #10 (B+ control) terminal stud (B). Use #10 split spring lock washer (33) and #10 nut (34) provided. Tighten nut to a torque of 25-35 in. lbs. (3-4 Nm). Place solenoid ground lead (35) small terminal on lower solenoid #10 (ground) terminal (C). Secure with #10 washer (33) and #10 nut (34). Tighten nut to a torque of 25-35 in. lbs. (3-4 Nm). Remove port side cylinder head cover screw (D). Place split spring lock washer (36) and solenoid ground lead terminal (35) on screw and reinstall screw. Tighten screw to a torque of 60-84 in. lbs. (7-9 Nm). Install J-clamp (25) on exhaust cover screw as shown. 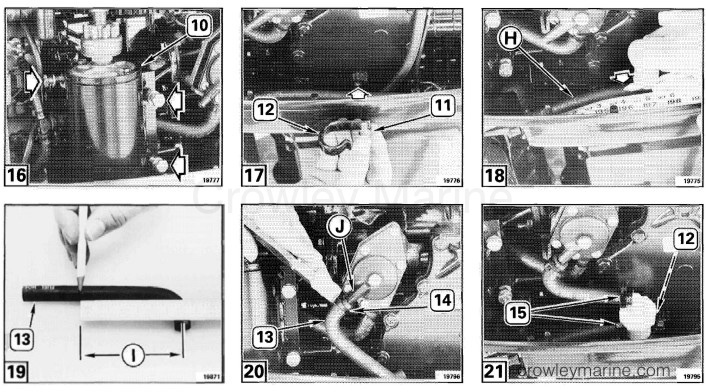 Route positive (red) battery cable (37) back behind starter motor between mounting bosses (E) under fuel pump outlet hose (F), behind the fuel pump inlet hose, and up to the solenoid top (battery) terminal (G). Secure positive cable with star washer (31) and nut (32). Tighten nut to a torque of 120-140 in. lbs. (14-16 Nm). Place cable in clamp (25). Close clamp tight around cable, and push clamp tight against exhaust cover. Route the solenoid-to-starter cable small end terminal (38) from the starter terminal (H) down and back under the starter, under the front mount (I) under the water outlet fitting (J) and back and up with the large end terminal at the lower solenoid terminal (K). Secure large end of cable to solenoid with star washer (31) and nut (32). Tighten nut to a torque of 120-140 in. lbs. (14-16 Nm). Secure small end of cable to starter using nut supplied with starter. Tighten nut to a torque of 60-84 in. lbs. (7-9 Nm). Remove port side top crankcase-to-cylinder screw (L) and discard it. Install 1/4-20 double end screw (30). Tighten screw to a torque of 60-84 in. lbs. (7-9 Nm). Route negative (black) battery cable (37) outside the starter and up to double end screw. Secure cable to double end screw with 1/4 inch start washer (40) and 1/4-20 nut (41). Tighten nut to a torque of 60-84 in. lbs. (7-9 Nm). Place rubber boot (A) over starter solenoid top terminal. Coat solenoid #10 terminals (B) with Black Neoprene Dip. Remove clamp (C) from front, port, lower engine cover. Remove and discard rubber plug (D). Place one battery cable grommet (42) in clamp opening. Lay battery cable on grommet. Place second battery cable grommet (42) on top of battery cable. Install clamp on top of grommet and cable. Tighten screws to a torque of 60-84 in. lbs. (7-9 Nm). To slip battery cable terminal cover (43) over the positive (Red) battery cable; Cut a hole or slot next to the sleeve on the terminal cover and split the sleeve with a knife. Use the tie strap (14) supplied to fasten the battery cable terminal cover to the positive battery cable next to the white sleeve. Pull the tie strap tight and trim off excess length. Always place terminal cover over end of positive battery cable whenever cable is removed from battery. Do not run motor with cable disconnected and unshielded against grounding. Electrical sparks and possible fire and explosion can occur. Install spark plug leads on spark plugs. Connect battery leads to battery. NOTE: Do not connect any electrical equipment directly to the motor's charging system. If the motor is run without a battery the equipment could be damaged. Install engine in test tank or use flushing adaptor. Shift motor to NEUTRAL. Check operation of starter. Shift motor to FORWARD and REVERSE and pull starter. Starter lockout must prevent manual starter from cranking engine when shift handle is in FORWARD or REVERSE position. Check the operation of the electric start system. Put shift lever in FORWARD, NEUTRAL, and REVERSE gear positions and depress start button in each position. Start button must not work in FORWARD or REVERSE. The alternator output can be checked with an ammeter attached between the two red leads, one from the starter solenoid and the other from the rectifier. The output should be approximately 2 amps at 3000 rpm. NOTE: If a tachometer is required, be sure to use only one of the recommended five pulse type tachometers. Use of an incorrect tachometer will result in improper propeller selection and engine overspeeding. Engine overspeeding will result in serious damage to the powerhead. Retain these installation instructions with your Owner's/Operator's Manual. They contain installation, adjustment and operating information for future reference and part numbers for future service. Always place terminal cover over end of positive battery cable whenever cable is removed from battery. Do not run motor with cable disconnected and unshielded against grounding. Electrical sparks and possible fire and explosion can result from grounding the battery cable on a running motor.